What an awesome and pleasant surprise this record turned out to be! A project that originally sprung out of the band The Peth with Rhys Ifans, Super Furry Animals drummer Dafydd Ieuan's The Earth is a project involving not only the SFA skins-man but also Mark Roberts of Catatonia. 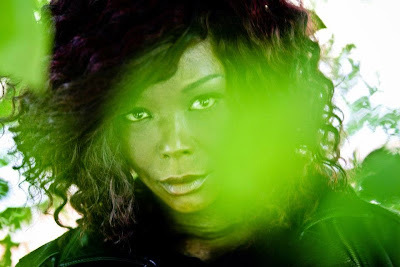 But Keltic Voodoo Boogaloo, out now on Strangetown Records, belongs undoubtedly to vocalist Dionne Bennett. What started out as a project to allow Bennett’s vocal gift to shine became a full-band project when Ieuan and Roberts craved their old fix of playing shows. Bassist Tristan Marley, a friend of Roberts' and a 'Beatles freak with perfect pitch' completed the line-up... Their Wednesday sessions continued regardless with a revolving cast of passing friends: if they could play an instrument and weren't too wasted, laughs Ieuan, the chances are that he’d record them. Somehow this laidback approach began to pay dividends: the songs were stronger than ever and Bennett -- already a secret weapon -- particularly excelled. Opener "Liberty Rd." storms in like the best thing Annie Lennox never did, all soulful vocals and surging riffs. "Quick Fix" feels like a Super Furry Animals song instrumentally but Bennett's vocals take it into another universe. Imagine if Tina Turner had sung some early Roxy Music jams. Can you dig that idea? Dig this then. Single "Baby Bones" recalls artists as disparate as Mary J. Blige and Shirley Manson. Like the slow-tempo numbers on a Garbage record, it's an unwinding and languorous jam carried forward on the near-10cc-like electronic underpinnings from Ieuan and his crew of Cardiff-based geniuses. The subtle "I Don't Fit In" and "Sea of Subterfuge" explore the sort of electronic textures heard on the last few Furries albums but with a set of new emotions thanks to the vocals of Bennett. "Supersticious Now" is sinister funk mixed with Adele-style vocal purring while "Rear View Mirror" is the sort of serious threat of a tune that makes it a cousin of "Vow" by Garbage or stuff on the first Sleeper record -- but with decidedly more real kick. The positively beautiful "Beautiful" eases into the girl group-ish "U Can't Have It All" with its 21st Century take on the stuff Lesley Gore was doing as she grew up a bit after crying over her spoiled party. Album closer "The Earth Beats the Machine" combines "Better Be Good to Me" Tina Turner with "Demons" by Super Furry Animals. There is no other way to describe this splendid and majestic cut. A distant relative of the stuff on the criminally underrated Paper Scissors Stone (2001) album from Mark Roberts' Catatonia, the song is a perfect showcase for this group. Highlighting the strengths of all the players here -- especially the guys from SFA -- "The Earth Beats the Machine" is the prog-y child of a lot of dissimilar genres but it works. Keltic Voodoo Boogaloo by The Earth is a fantastic record and a darn impressive melding of styles that really shouldn't work this well together. Fans of Super Furry Animals should groove on the underlying...grooves. Fans of Catatonia should respond to the emphasis on the song-craft. And fans of good music should respond immediately to the soaring vocals of Dionne Bennett. Follow The Earth on their official Facebook page. Keltic Voodoo Boogaloo is out now on Strangetown Records. Play Wonderful New Deers Track Here! Free Tunes From J Xaverre (ex-Kenickie)!